There's a knock on the front door. Salt Bush Billy is here with the lamb. He has driven all the way from his farm in the river country near Deniliquin in the southern NSW. Also known as Bill Williams, in his arms he carries an ice-cold box of expertly butchered Wiltshire Horn lamb. It is perhaps the best tasting sheep meat in the country. He spends a day on the road each month delivering his lamb to a select group of customers around NSW and Victoria, mostly in the cities and big towns. He keeps in touch with them on Instagram and Facebook and processes payments on a credit card reader tethered to his mobile phone. Like many farmers, Williams was sick of sending his animals off to market where they would get only a set price depending on weight. By delivering direct, he gets a better deal. "It means more to me than just the money," he says in his deep bush drawl. "It's about the relationships and all the sharing of knowledge and information." He likes his tucker and shares a recipe for slow-cooked lamb shoulder. Williams is one of the growing number of farmers who are fed up with the poor returns they receive dealing with the modern commodity-driven food chain. They are turning their back on traditional distribution models that can involve multiple middle men such as wholesale markets, processors and retailers, each taking a slice of the pie. Instead they are finding new ways and new business models to connect directly to their customers. Using social media, new electronic hardware and specially created sales software they are selling directly to people like you and me. The result is customers are getting better, fresher, more ethically raised food. In return, farmers get direct lines of feedback from their customers, less food waste and more money in their pockets. The methods farmers are developing are varied and different but what unites is connection. Direct connection between the farmer and the eater. One of those forging connection is Alice Warner. She has a small farm protected by a sprawling grove of pecan trees on the banks of the Hawkesbury River on the outskirts of Richmond, 65 kilometres north-west of Sydney. Here, the former primary teacher grows vegetables for about 90 families living around Richmond and Sydney's west with a business she calls Five Serves Produce. In the rich alluvial soil, irrigated by the water of the Hawkesbury, she grows more than 30 types of vegetables. She raises leafy greens, herbs, tomatoes, squash and cucumbers, carrots and parsnips, beans, winter greens, turnips and onions. Her customers pay her 13 weeks in advance to grow their vegetables in a system known as Community Supported Agriculture (CSA). In this model she and her customers share the risk that she will have a good season and that hail or caterpillars won't take out the crop. Their crop. In return, Warner sends a box of freshly harvested, washed and chilled vegetables to their home once a week. "I communicate with customers via email about what to expect each week," says Warner with a grin. "Because there can be some repetition of vegetables from week to week, I will email recipes on how to cook certain veg," she says. "This season has been really hot, which has meant that some leafy greens didn't do so well so the offer was limited. That is out of my control but if I can communicate what is going on the farm (via the website and email) the customers involved in the CSA are more understanding and willing to compromise." Warner says there is a certain amount of churn and that a CSA is not for everyone. "To be involved in a CSA you really need to know how to cook. Or follow the recipes and ideas that we share." 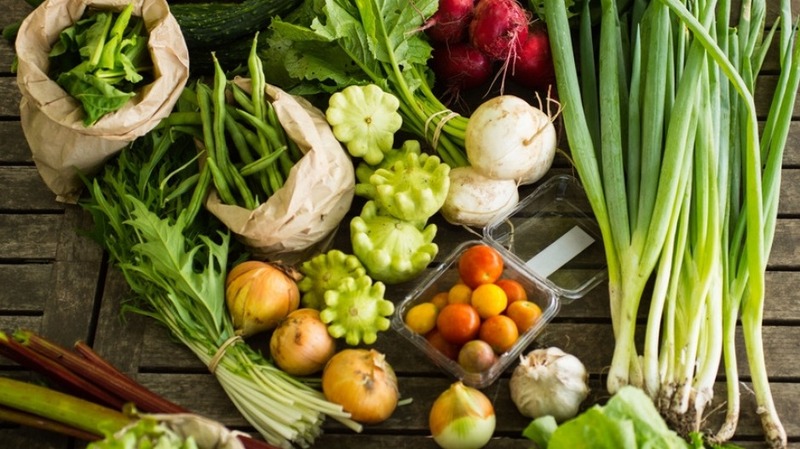 According to CSA Network Australia and New Zealand there are 34 CSAs in Australia with 17 in Victoria and nine in NSW selling everything from fruit and veg to organic pork, lamb (half a lamb to your door for $16.75 a kilo? Sure, no problem), beef and chicken. 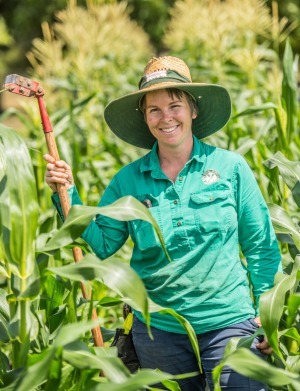 There are also some volunteer organisations such as Southern Harvest operating in south-east NSW and Canberra that consolidate the fruit and vegetables from smaller farmers. These are farmers who appreciate being paid up front but because of size or regional climate may not be able to grow a diverse enough range of fruit and vegetables to feed a family. The various produce is consolidated into boxes weekly and sent off to set locations at set times. One of the big players connecting farmers and eaters is Australia Post. Seven years ago they set up an online marketplace where farmers could sell their products direct to the public. Called Farmhouse Direct it started with 40 farmers and now has 400 nationwide. Farmhouse Direct processes the payment, takes a 7.5 per cent commission and the farmers use the existing postal network to ship the product. "It is great for producers who live in remote locations," says Farmhouse Direct's Monique Barwell. "We have a woman who hand smokes trout in Grenfell in the central-west of NSW. It's very small production but a great product," says Barwell. "She used to have to drive to Canberra to sell her fish. Now, using Express Post and ice packs, is selling them around the country." South Gippsland is fertile country known for its deep soil, reliable rainfall and close proximity to the Melbourne markets to sell the lamb, beef, dairy products and vegetables grown in the area. 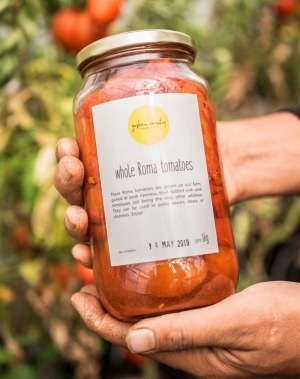 This green and hilly region is also home to perhaps one of the most audacious "farmer to eater" direct models in the nation and is called Prom Coast Food Collective. Sally Ruljancich​ and husband Colin Trudgen run their own CSA, Colin and Sally's Organic Lamb and Beef, a business with a 25-year waiting list. She and fellow farmer Amelia Bright, from Amber Creek Farm and Sawmill, created an online marketplace for farmers and producers in the region using an existing online platform called Open Food Network. This not-for-profit website allows food producers to sell directly to customers and to organise themselves to collaborate and work together. Ruljancich and Bright organised about 25 farmers and makers to list their produce on the site – everything from butter and cheese to apples and chicken. They then used social media to identify possible customers to commit to the project. The award-winning organisation is now two years old and has about 120 customers. They go onto the Prom Coast Food Collective website and click on the products they want from all the different producers. There is just one payment made by the customer but the platform pays each of the farmers directly and immediately without taking a fee. Then, several weeks later, on the third Sunday of the month, customers go to the Blue Tree Honey Farm in Dumbalk. It looks like a farmers' market except the farmers hand over the order and no transactions are made on the day. "The beauty is that farmers only bring what they have sold, says Ruljancich. "Unlike a farmers' market where a farmer might drive home with a whole lot of unsold meat, the farmers are in complete control of their stock. It is low risk, no waste. A model of collaboration." The farmers meet again on the following Sunday in the town hall at Dumbalk but this time they pack their produce into boxes bound for drop-off points around metropolitan Melbourne, the Mornington Peninsula and Gippsland. "We turned two last week and in that time the collective has returned $351,590.20, ploughed back into local farms," says Ruljancich. "The model did not take anything to get up and running. And no funding." A similar model using the Open Food Network exists in Beechworth, a town of 3000 in north-east Victoria. 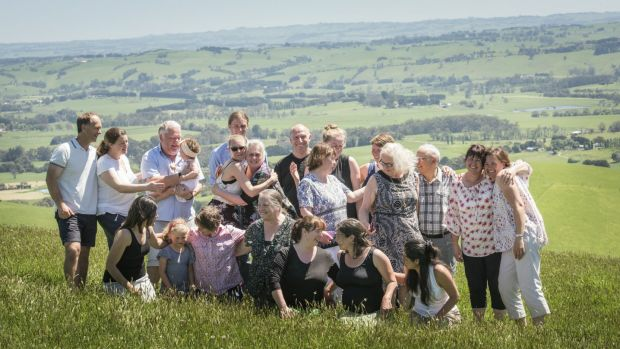 Jade Miles, founder and president of the community-owned enterprise Beechworth Food Co-Op, has brought together 35 farmers and about 800 customers. The shopping is done online using the Open Food Network website and pick-up is done on a weekly basis in Beechworth. "What is really interesting is that farmers are also using the Open Food Network to sell to other people around the nation," says Miles. She adds that once the payment system is set up, farmers are free, with no fees or charges, to sell their food anywhere on their own terms. "These alternative forms of food distribution are essential for farmers. We have an apple orchard," says Miles. "There is no way in the world we would be viable as regenerative farmers if we sold to the wholesale market," she says. "We need to have different models: pick-your-own, sell direct to restaurants, sell through the co-operative and deliver direct to people's front verandah just to make a decent living." Farm gates are one of the most traditional ways farmers have sold their produce and they still thrive today. But many farmers are upping the ante on the oft-seen box of limp cucumbers and an honesty box. Chef-turned-grower Michael Burness is a man who knows his customers by name and what they like to eat. 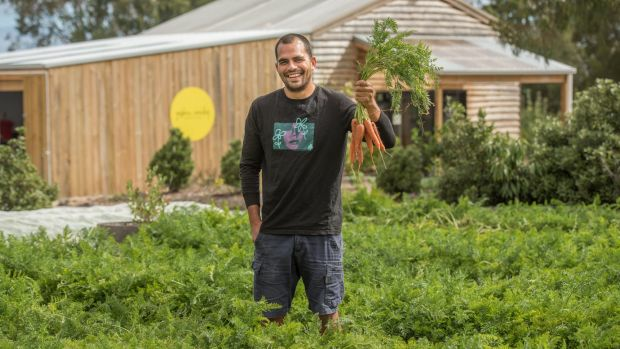 A few years ago, he traded his pots and pans for a spade and a hoe to grow and sell fruit and veg on a plot of family land on the outskirts of Wonthaggi, 140 kilometres south-east of Melbourne. He and wife Emma built a bucolic wooden shed with a commercial kitchen out the back and named it Goshen Country (25 Wilsons Road, Cape Paterson). Here they have about 300 fruit trees and about half a hectare under garden beds, plus a green house in which Burness is able to extend the growing season. Garden scraps are fed to the flock of 115 chooks and the less beautiful but equally delicious fruit and vegetables are preserved in glass jars in the kitchen. The scene is idyllic. Everything grown on the farm is sold through the farm gate with some excess heading to local restaurants. "We have a business that is building every week," says Burness. "We are excited that there are a lot of local families who are choosing us for their fresh vegetables." When asked if his new business is profitable compared to a life as a chef, he says nothing. He simply grins. A short drive away is another South Gippsland farm gate, Macca's Farm at Glenforbes. A larger scale operation than nearby Goshen Country, it includes large greenhouses, strawberries growing hydroponically in waist-high raised beds, a herd of beef cattle and a herd of wessex saddleback pigs. Just off a busy tourist route it appeals to both locals and tourists with pick your own strawberries and a paddock to plate cafe. In the green houses are lettuce, tomatoes, eggplants, cucumbers, chilliess and capsicum that are sold through the farm gate alongside additional fruit and vegetables sourced from nearby local farms and the wholesale market. 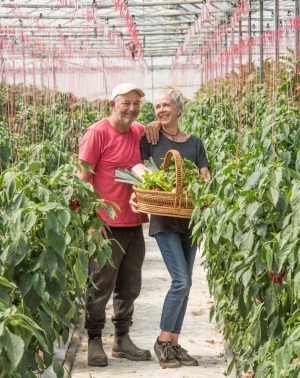 "You can't make money growing veg in hothouses and sending it to market," says owner Peter McDonnell. "You're a price taker." His wife Angelica Christensen works in the cafe kitchen cooking light meals such as juicy burgers made with beef and vegetables from the farm. Christensen also value adds to the produce by pickling vegetables and making jam in the second commercial kitchen. Although only two years old, there is room for expansion with an on-site butchery where McDonnell hopes to make smallgoods in the near future. There is no one collective website listing all of Australia's farm gates, but local tourist associations often list them by area if you are looking to discover them near you. There are hundreds of farmers and suppliers listed on the Community Supported Agriculture, Open Food Network and Farmhouse Direct platforms. Here are just a few. Piccolo Farms services the western and south-western suburbs of Sydney with a $40 weekly or fortnightly box with a dozen different vegies grown on the farm at Thirlmere near Picton. Fresh apples in autumn and winter, and cherries in summer delivered to your door direct from the high-altitude orchards at Batlow. Every week the crew from Full Circle Farm from Jilliby on the Central Coast drop into towns and suburbs such as Frenchs Forrest with a refrigerated van full of top-quality, grass-fed Speckled Park beef, plump chooks, honey, eggs and pork from a neighbour's farm. They send a reminder out via text when and where they'll be and you rock up with card or cash. First in best dressed. On Grace Spring Farm at Kulnura, inland from the Central Coast, big-breasted muscovy ducks graze alongside chooks and beef cattle. The farm delivers beef, chicken, ducks and duck eggs along the Central Coast and has a pick-up point in Ryde one Sunday a month. If you're planning a party and want a sensational little pig for the spit, Melanda Farms will deliver a pig to your door. Bundarra Berkshires can deliver three kilograms of fresh pork in chilled, environmentally friendly packs anywhere in Sydney overnight (Melbourne also) or deliver larger orders as part of its Swine Club subscription service weekly. Award-winning Wapengo Rocks certified organic Sydney rock oysters are delivered live and unopened to your door using overnight courier – minimum 10 dozen (Melbourne also). In the deep volcanic soils of central Victoria grow some of the best vegetables in the country. 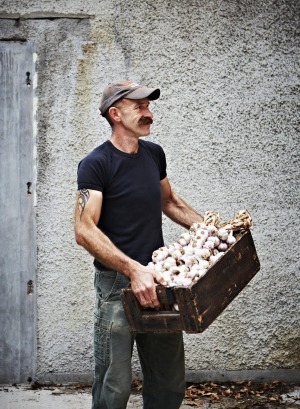 Angelica Farms is a small organic farm at Glenlyon, near Daylesford. It has a few CSA subscriptions left for the autumn/winter season and delivers to locations in Melbourne. Get in fast, its winter carrots are so sweet and its brassicas tight and delicious. Gippsland Natural is a collective of beef farmers that adhere to a strict code of environmental conditions. Buy beef packs to fill the freezer for under $200 delivered to your door. Chianina is an Italian beef breed known for its great-tasting steaks. You choose between different 10kg packs of butchered beef, from cattle raised on pasture on a farm in South Gippsland. One of the first to deliver direct to the public almost 20 years ago, Rutherglen Lamb home deliver expertly butchered whole lambs to your door in Melbourne and parts of regional Victoria. Milking Yard Farm chickens are specially bred for the Australian outdoors and raised on pasture and housed in specially built sheds near Trentham. They're big, full flavoured and really good for a slow-cooked coq au vin. The farm delivers Thursday and Friday around Melbourne and the Mornington Peninsula. Full-flavoured, pasture-raised ducks reared on the side of a volcano near Daylesford. Vue du Volcan farms offers deliveries to Central Victoria and Melbourne through its CSA model, or online orders when stock is available. Beautiful Puy lentils and other pulses grown by committed biodynamic farmers in the Wimmera. Shipped to your door via Australia Post.